In the past few years, athleisure has been one of the more prevalent trends in the fashion and apparel industry. It’s no surprise that with the surge of consumer enthusiasm—and willingness to spend—that it’s an extremely competitive space for businesses to be in right now. Athleisure is a billion dollar market, and everyone wants a piece of a pie—but only a few brands have excelled in the industry. Alo Yoga is one of those few athleisure brands that has managed to stand out from the pack. While its products are incredibly stylish and high-quality, it’s been the marketing team that’s propelled the company to such levels of success. There are four things in particular that Alo Yoga’s marketing team has been doing that have been extremely beneficial to the brand. Alo Yoga has a distinctive brand, and in today’s crowded digital world, branding in marketing is everything. The brand sells “studio-to-street” clothes, embracing the multi-purpose role of today’s athletic clothing. Alo lives up to its branding through its designs, with products including “distressed” and “moto” leggings that look like skinny jeans and leather pants respectively. Alo Yoga also consistently use certain key phrases as part of their digital branding, such as the word “goddess.” One of its branded hashtags is “#beagoddess,” and the brand keeps it consistent with products names such as “high waist goddess legging.” The brand feels intentional and complete without hitting you over the head with it. Consistency in digital marketing branding counts for a great deal and Alo Yoga maintains its branding across multiple channels. It’s not always about what you know, but who you know. That stands true in marketing as well as life. Alo Yoga is a networking powerhouse, partnering with other brands, influencers, and yogis across the world. 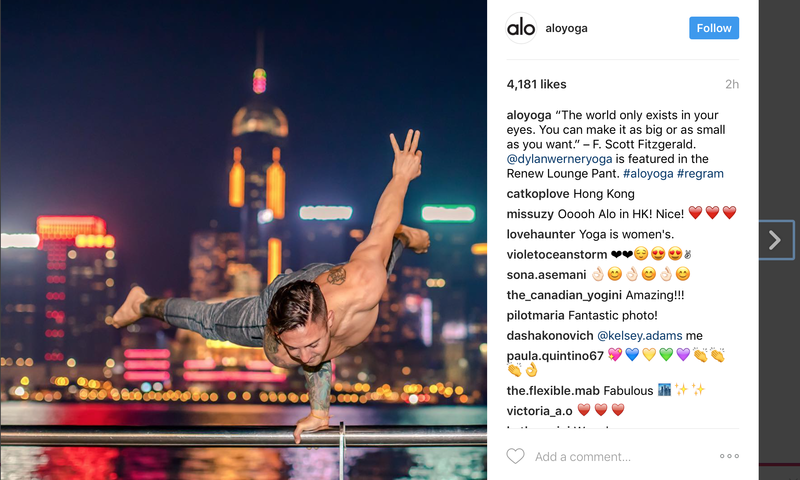 Alo Yoga’s Shoppable Instagram Feed (disclosure: Powered by Pixlee) is displayed on its site– and features plenty of content collected or regrammed from social influencers and micro-influencers alike. This content helps to expand the visibility of Alo Yoga’s brand and gives its products added credibility in the form of social proof. Yet the brand doesn’t stop there. It also builds relationships with other businesses. 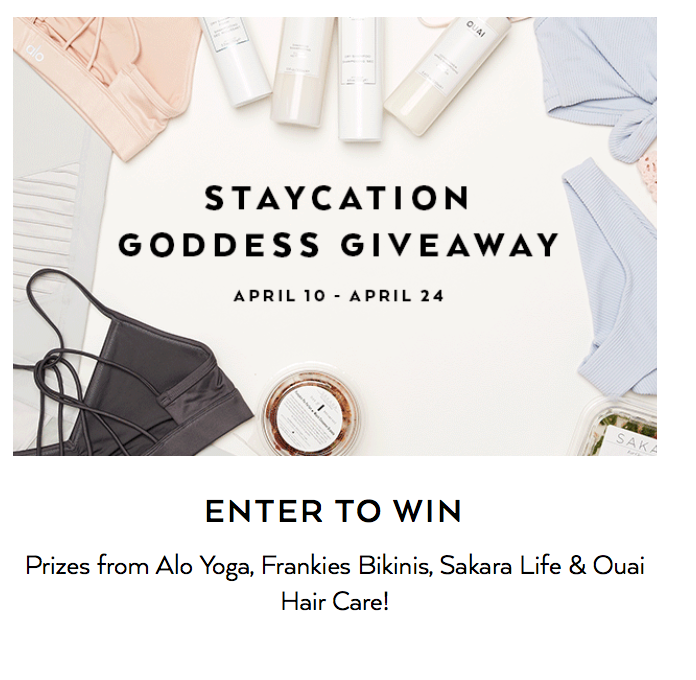 Alo Yoga recently ran a Staycation Goddess Getaway, which included prizes from other businesses that complement Alo Yoga products. In the process of this campaign, each of these businesses promoted the others while sharing information about the social contest. User-generated content (UGC) is extremely persuasive and Alo Yoga has made it a central part of its digital marketing strategy. Not only does the brand share it across its social channels, homepage, and product pages– but it features a clear call-to-action asking other customers to share their photos of Alo products. User-generated content media is earned media, and placing it in prominent positions on your site lets customers know that other users endorse your brand, brand lifestyle, and products. Alo Yoga always, always uses its branded hashtags when sharing on social media. This helps the brand to build brand awareness and recognition, and when users go to share their own content featuring the brand’s products, they never have to doubt about which Alo Yoga hashtag(s) to use to help the brand find their posts. Building a strong following and a community around your brand is essential to surviving in any industry, but it’s especially important to define your brand if you’re in a crowded market. Alo Yoga is a digital business in a competitive field, and yet it has managed to thrive despite both of these challenges. The brand has embraced digital brand management and has done so in a way that sets an example that all emerging businesses can replicate.